One of the exclusive benefits of your credit union membership is access to TruStage insurance products. In fact, our credit union makes an Accidental Death and Dismemberment (AD&D) policy available at no cost for our members. AD&D insurance provides benefits for accidental death and covered permanent injuries which result from accidents. As a member of our credit union you automatically qualify for this no-cost coverage, but you must activate it first. In addition to your complimentary coverage, you can also add more coverage if you like. Why? Because an accident that causes death or permanent injury could have a lasting financial impact on your family. For more information, go to www.TruStage.com/ADDcoverage. 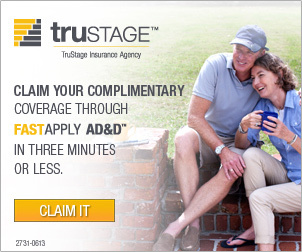 Use the FastApply AD&D process at www.TruStage.com/ADDcoverage to activate your no-cost coverage in three minutes or less or apply for additional coverage. You can also call 1-800-798-8798. There's no cost or obligation. Credit unions like ours make TruStage insurance programs available because they're founded in value, honesty and knowledgeable support. The companies behind TruStage were formed by credit unions, for credit unions and their members. As part of your financial planning, we invite you to discover how these products and programs might be right for you. TruStage™ Accidental Death & Dismemberment Insurance is made available through TruStage Insurance Agency, LLC and issued by CMFG Life Insurance Company. The insurance offered is not a deposit, and is not federally insured, sold or guaranteed by your credit union.